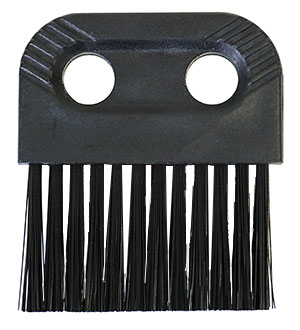 Full Body Camel Hair Brush secured by a crimped metal ferrule. Ideal for cleaning cryostats and microtomes of debris and dust. Overall length 22.86cm (9"). A carefully selected No. 1 Superfine eyelash is attached to a finely balanced wooden handle for delicate manipulation of ultra-thin sections in the knife boat of an ultramicrotome or wherever delicate teasing or manipulation is required. These special eyelashes are chosen due to their excellent taper and strength and are of the highest quality available. Tip shown actual size. Selected, single deer hair brush for manipulating thin sections on water or separating small particles using a microscope. The ultrafine deer hair is attached to a 6-1/4" (159mm) long wooden handle. 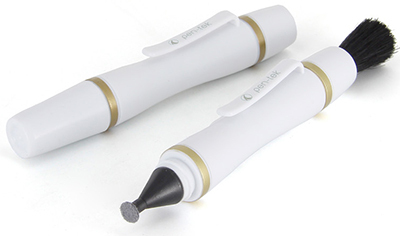 The Pen-tek Lens Cleaning Pen is the perfect tool for cleaning optical lenses. This pen-shaped cleaning tool has a small, lightweight, cleaning pad on one end with a retractable dust removal brush on the other end. It is easy to use. No more fingerprints, dust and debris. A unique non-liquid cleaning element removes fingerprints without damaging the surface and never dries out. 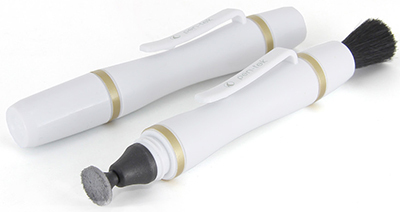 The Micro Pen-tek (#51912) safely and effectively cleans micro camera lenses. With its specially designed Micro-tip, flat and round tip, (#51912-1) it applies the invisible carbon compound to places its bigger brothers can’t reach. Retractable brush removes dust and the unique invisible carbon compound outperforms all other cleaning systems. 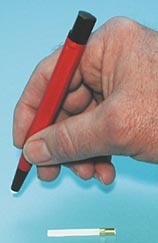 The Pen-tek (#51914) comes with the Filter-tek Tip (#51914-2) for lens and filter cleaning. Digi-tek semi-triangular shaped tip (#51914-1): cleans into the corners of the screen. Designed specifically to clean the small digital glass and LCD screens, general lenses, PDAs, cell phones, etc. Round and concave cleaning tips (#51914-2): designed to clean digital camera filters, digital cameras, binocular lenses, eyepieces and other optical items. Round and flat cleaning tip (#51914-3): designed to clean filters for digital cameras, video cameras, and more. Brass brush works on gold, brass and copper. Silver and aluminum are better handled with steel brushing. 21cm (8-1/4") overall length. 4 rows of bristles, 11.4cm (4-1/2") long, 1.9cm (3/4") deep. Bristles may be replaced by refills, 9.5cm (3-3/4") long. 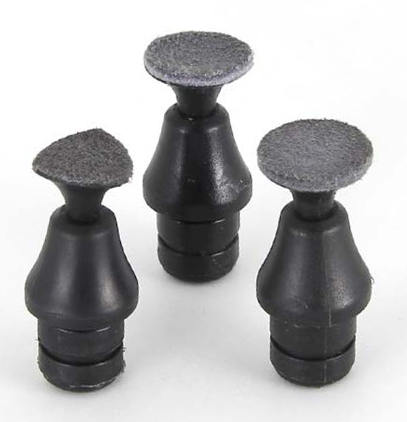 Can be used for fine deburring, polishing, cleaning or burnishing. Set with retractable plastic handle contains one brass, one steel, one nylon and one fiberglass brush. Overall length is 120mm (4-3/4"), brush is 3.2mm (1/8") wide. Static electrical charge is generated between materials through friction, pressure or separation of two materials. This is sometimes called the Triboelectric Effect. A material that inhibits the generation of static charges (generally less than 200 volts) from triboelectric generation is classified as anti-static. Anti-static materials used to make brushes include Wood, Hog Bristle, Horse Hair and Goat Hair. These materials can be used in ESD sensitive areas as long as the brush remains in a liquid environment. In a dry environment only conductive or dissipative materials should be used in ESD safe areas. Anti-Static brushes are made from low charging and natural materials that are near neutral on the triboelectric chart. They neither give nor take electrons and, therefore, remain essentially electrically neutral. There can, however, be a slight charge created. In extreme voltage sensitive applications, these brushes should be used only in a liquid environment. If the mounting location is not grounded, a grounding strap or wire incorporating a 1 megohm resistor should be used between the brush and an electrical ground. Potentially severe bodily harm may result from the use of a conductive brush if a 1 megohm resistor is not used. 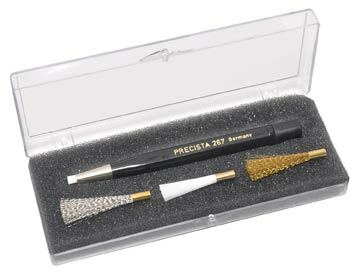 These dissipative brushes have a surface resistivity of 105 to 1011 ohms, a higher resistivity than the conductive brushes but sufficiently conductive to preclude any static buildup in the brush. These are excellent tools to use in removing any static charge that will result in the adhesion of particles such as dust to an object. Please use these brushes with a wrist strap or other mechanism to provide a path to ground for safety. Thunderon is a very fine (0.04mm, 0.0015"diameter) acrylic fiber chemically bonded with copper sulfide. This special fiber will dissipate a charge on an electrically charged surface. The surface resistivity of Thunderon is 102 ohms. The plastic handle is dissipative with a surface resistivity of 105 Ohms. Handle Length 24.8cm (9-3/4"), handle width 6.4mm (1/4"), bristle trim length 31.8mm (1-1/4"), bristle length 13cm (5-1/8"), bristle width 7.9mm (5/16"). Handle Length 10.2cm (4"), handle width 6.4mm (1/4"), bristle trim length 31.8mm (1-1/4"), bristle length 8.7cm (3-3/8"), bristle width 4.7mm (3/16"). Bristles are made of conductive nylon fibers that remove static as they clean. Because it won't scratch critical surfaces, it's ideal for cleaning film, slides, optics, cuvettes, balance pans, microscopes, electronics and computer monitors. It has a conductive composite handle. Handle Length 5.7cm (2.25"), handle width 6.4mm (1/4"), bristle trim length 31.8mm (1-1/4"), bristle length 6.35cm (2.5"), bristle width 7.9mm (5/16").